The Night Before is a messy film. Luckily, it’s a very funny mess. 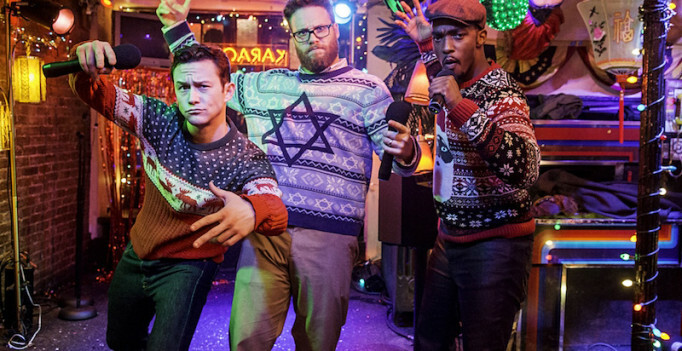 The yuletide stoner comedy – starring Joseph Gordon-Levitt, Anthony Mackie, and Seth Rogen – feels as if it was born from various ideas and ambitiously threaded together by screenwriters Evan Goldberg, Ariel Shaffir, Kyle Hunter, and Jonathan Levine. Levine also directs the film – it’s the first time the filmmaker has handled material this loose. Jonathan Levine previously directed Gordon-Levitt and Rogen in the crowd pleasing dramedy 50/50, and he also satisfied audiences with The Wackness and Warm Bodies. He’s a filmmaker who works well with a traditional narrative because he can then afford to focus more on individual characterization and chemistry between his actors. Since the film’s widespread cast have the strength to maintain fluency in their comedy and on-screen relationships (some already starred together in Rogen/Goldberg’s This Is The End and are equally as funny here), I’m guessing the filmmaker felt comfortable enough to use The Night Before as an opportunity to take new risks and embrace a formula that has been popular with graduates of the Apatow school of comedy. It turns out that Levine needs those common story steps for support – that shouldn’t discredit him. It’s the same reason David Gordon Green often has a hard time fitting in with the Apatow inspired material he’s hired to control. People like Levine and Green follow a different set of rules, and when they become curious about directing other types of movies, it’s these experiences that will help them reflect and discipline. Movie goers experience the growing pains from another perspective, and we hope for worthy prizes. Thankfully, The Night Before still delivers. 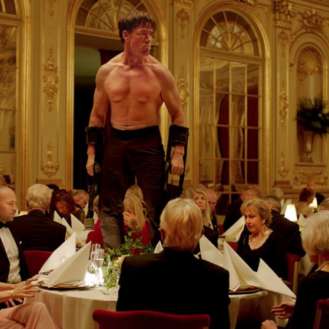 As with most modern comedies, some scenes in The Night Before need an extra nudge on the movie’s conveyor belt to move on to the next comical run-in. The cast, who are all very much nestled in their own comfort zones, don’t mind stalling to milk a reaction from all directions. Since no one is in a hurry, the performers are always content. On the other hand, it’s strange to listen to so many jokes that seem as if they were written backwards, meaning the screenwriters started with a punchline and worked their way in reverse to set up the situation. Some of them work (a lullaby version of Run DMC’s ‘Christmas In Hollis’, drug-induced fantasies with Rogen, conversations with an awkward limo driver played by Nathan Fielder), and some feel premature despite having the help of a celebrity (a public display of affection egged on by Miley Cyrus [as herself]). The Night Before is racy and hilarious despite being too enabled for its own good. Good luck to television stations who plan on taming and editing this one for holiday syndication.